It is not uncommon for athletes to draw focus toward big picture expectations, losing sight of the little things that need to take place to achieve the highest aspirations. “What’s the best way to increase UTR and TRN ratings?” At DTS, we hear this question constantly. There certainly are tangible ways to address that goal, including scheduling the proper tournaments, playing enough matches, understanding how each entity operates, etc. However, for the purpose of college recruitment, the overall development and mindset of an athlete is often missed when seeking the quick answer to the above question. In essence, there is no shortcut. As a former collegiate coach, I often reflect on pre-season individual meetings where expectations for the upcoming season were discussed. Many times, a student-athlete would share lofty plans, statements such as, “I am going to be an All-American”, or “I want to win NCAA’s”, or “I want to be first team All-Conference”, etc. Similarly, junior players will often tell me, “I want to be an 11 UTR by next fall” or “I want to be a 4 star when the next ratings come out”. With each conversation, my response to the vision is always, “How? How are you going to be an All-American this year?” “How are you going to be an 11 UTR next fall?” Inevitably the next response would be something along the lines of, “I am going to win all my matches.” “How?” “I am not going to miss a ball.” This process continues until more concrete responses, which can be used as short-term goals, emerge. Process is something that can easily be set aside in the psyche of an athlete. It is not uncommon for athletes to draw focus toward big picture expectations, losing sight of the little things that need to take place to achieve the highest aspirations. Details not only matter in goal pursuit, they are everything. The greatest players in the world possess an unrelenting drive to improve, which is central to their process. Focusing on how details can always be executed better can make the difference over the course of any player’s competitive season. With the current rating and ranking systems in tennis such as Universal Tennis Rating (UTR) and the ranking and star designations on the Tennis Recruiting Network (TRN), it is all too easy for competitive tennis players to regularly overanalyze their daily status. Constantly checking in on, and worrying about, rankings and ratings quickly skews what really matters; that is, the process of development. Many prospective college tennis players could admit to inner dialogue which sounds something like, “If I lose this point, then I will lose this match; and if I lose this match, my UTR is going to go down; and if my UTR goes down, the coaches at schools I want to go to will lose interest in me; if the coaches lose interest in me, I will not be recruited to play college tennis.” Suddenly, the opportunity to manage one simple point in a match transforms into an intimidating lifetime dilemma. While outcomes are tracked in a sport that records wins and losses, obsessing about outcomes such as rankings and ratings does not allow any player to perform at his or her highest in the moments of competition or training. Instead of being tied to ranking and rating outcomes as they develop their games, players should become fully engaged with the process of their performance. That is always easier said than done, and most players want to know how to stop thinking about the “elephant in the room” when they really want to win and show their best results. Dr. Carol S. Dweck, in “Mindset: The New Psychology of Success,” details the benefits of what she calls a growth mindset. A growth mindset is one that focuses on the value of improvement. It encourages constant learning and a drive to always get better. Growth mindset thinkers thrive on competition because they understand that one is not defined by a result, or tournament, but rather the entire journey. A potential, and often inevitable, dip in performance and results along the tennis path becomes just another challenge to overcome, rather than a devastating crisis (Dweck, 2006). When a player’s mindset allows room to see a loss or poor performance as part of development, a player can evaluate performance in a much more effective manner. To assist in developing a culture of growth, coaches and parents could avoid asking about results and inquire about what kind of improvement or development occurred. Asking what a player did well, or could improve upon, can effectively shift a perceived negative result toward a positive in the proper mindset. This allows a player to focus on, and have some control over, the process of development and improved performance. In turn, the potential to achieve desired outcomes, without focusing solely on results, is increased. Certainly, changing a mindset is not something that a player will achieve overnight, but there are long term strategies that players can employ to be successful in process-oriented training and competition. As lovers of tennis know, tennis is an incredibly challenging sport and is not one judged on the execution of perfection. Tennis sets up countless scenarios pitting a player against his or her opponent and, in every match, there are hundreds of opportunities to feel and react negatively because an error was made, or one was outplayed. Universally, tennis players have moments during practice or competition where they lament that things are just not going their way. Statistically, however, it is quite uncommon to play matches, even have great wins, in which everything goes one player’s way. The key to shaping the proper mindset is to find a way to replace self-doubt or frustration with positive reinforcement. Developing a “can do” attitude is a vital component to making this shift. Reshape the conversation following practice and matches. Parents and coaches should aim to focus encouragement on process and development rather than wins and losses. Instead of first asking, “Who won?”, ask how a player performed overall or what he or she is excited to bring to the next practice or match to continue to move toward his or her goals. Players should re-shift internal narratives to things that can be controlled. Players are the ones who control inner voice, mindset and attitude and can consciously direct focus to process before outcomes. Reshape training to reshape competing! There is no on/off switch that can be magically employed when a match situation calls for it. These helpful skills and patterns develop over the course of time and require practice. 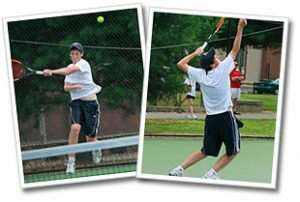 Effective and rewarding process-oriented competition starts at the practice courts. Develop SMART goals: Specific, Measurable, Achievable, Relevant, Time-Bound. Effective and well thought out progress goals will help keep your priorities and actions clear. Smaller developmental benchmarks that can be tracked along the way will inevitably show a path toward larger outcome goals. Be Accountable and Positive! As the saying goes … “Excuses get old, but winning never does.” Avoid being the player who always has a reason why something did not go right, and become the player who “can do” something right toward development, even if the result isn’t a win. Own errors and learn to acknowledge how they play an important role in improvement. Be prepared to compete within an effective mindset. It is easy in the heat of competition to lose focus, so bring note cards on the court with simple reminders of what the match and training objectives are. Use changeovers to reinforce positive messages and process. In the big picture, a player is not in complete control of who wins or loses, but a true competitor can control preparation and effort for the best possible performance. While wins and losses will continue to hold importance in a player’s college tennis recruitment, sole focus on those outcomes is precisely what can prevent a player from achieving the desired results. Having the right mindset and attitude allows developing players to engage in the process and journey of improving. Charles Swindoll said, “Life is 10% what happens to me and 90% how I react to it (Swindoll, n.d.).” Process matters, and practicing process matters! Prospective college athletes should become enamored with process before outcomes and the desired outcomes, in time, will follow, as will the attention and admiration of coaches. 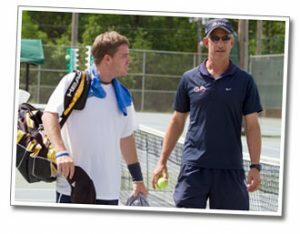 Donovan Tennis Strategies has been helping prospective college tennis players and their families navigate the recruiting process since 1997. In addition to consulting services DTS runs three College Prospects Showcases to help players get exposure to college coaches.